Phillips 66 Pipeline LLC operates approximately 15,000 miles of pipeline and nearly 50 storage terminals in the United States. Every day, our pipelines safety transport the raw and refined petroleum products (like crude oil, gasoline, diesel and jet fuel) that keep our homes comfortable, our transportation systems running smoothly, and which create the plastics products that we use in our day-to-day lives. Because of their importance, pipelines operate under many government regulations and industry standards in order to ensure safe and reliable operation. These guidelines touch on all aspects of pipeline construction and operation – such as where and how they are built, how and how often they should be tested and maintained, and rules for the day-to-day controls on our nation’s infrastructures. Phillips 66 Pipeline LLC has maintained a consistent and successful safety record. And, nationally, pipelines are recognized as the safest mode of transportation for hazardous liquids products. Despite an exemplary safety record, however, we want anyone who works near our facilities to know the hazards of a pipeline leak. Pipeline product hazards, like flammability or explosion, are different depending on the specific type of energy product carried in the pipeline. Refer to the chart below for greater detail, but, even the smallest incidents can result in significant monetary loss for your business and your community due to fines, traffic disruptions, job delays and even loss of life. The U.S. Department of Transportation Pipeline & Hazardous Materials Safety Administration (PHMSA) provides useful hazardous materials information. PHMSA jointly publishes and distributes the Emergency Response Guidebook as an aid for first responders to quickly identify and provide protection from specific hazardous materials involved in transportation accidents and incidents. The following table is a simplified list of common pipeline products and their associated hazards. Determine what is carried in the pipeline near you by visiting www.npms.phmsa.dot.gov or reviewing the information captured on a nearby notification sign (called a pipeline marker). REFINED PRODUCTS Refined products vary widely in color. Vapors are heavier than air and tend to settle to the ground. Gasolines of various kinds are the most flammable.Kerosene and fuel oil are somewhat less likely to ignite, but should be considered dangerous. Breathing low concentrations of refined products leads to little health hazard.Contact can sometimes cause minor skin irritations; however, refrain from contact. Higher concentrations of refined products may lead to asphyxiation. CRUDE OIL Color can vary from yellow to nearly black.“Sour crude” contains hydrogen sulfide (H2S), and, under certain conditions can be recognized by its rotten egg odor. Vapors are heavier than air and tend to settle near the ground. Flash points of crude oil mixtures can vary.Will burn, producing heat and smoke. Can cause throat and eye irritation as well as breathing difficulty.Heavier concentrations will cause dizziness similar to intoxication and may lead to serious breathing difficulty, even death. HIGHLY VOLATILE LIQUIDS (HVLS) Colorless.It is transported as a liquid but becomes a gas and forms a vapor cloud when released into the atmosphere.Vapors vary in size depending on weather conditions.If the vapor drifts from the immediate vicinity of a leak, becomes much less visible and detected only by a monitor. Vapors are heavier than air and tend to settle to the ground, especially in low-lying areas. Vapors are highly flammable and ignite very easily.Fire hazard is higher on a calm day, since vapors remain more concentrated instead of dispersed in the air. Vapor displacement of oxygen can result in asphyxiation.Vapors can cause severe freeze burns when in contact with skin. Some HVLs contain hydrogen sulfide (H2S).Light concentrations of H2S will cause throat and eye irritation as well as breathing difficulty.Heavier concentrations of H2S will cause dizziness similar to intoxication and may lead to serious breathing difficulty, even death. NATURAL GAS A colorless gas. Vapors from liquefied gas are initially heavier than air and spread along the ground.Vapors may travel to source of ignition and flash back. Natural gas, alone, does not burn.Combustion only occurs when there is a mixture of gas and air, containing between five and 15 percent of natural gas. Harmful, even fatal, if inhaled or absorbed through the skin. HYDROGEN A odorless, colorless gas. Vapors may travel considerable distances to a source of ignition where they can ignite, flash back or explode. Extremely flammable, burning with a clear flame that can be difficult to see. Can reduce the oxygen available for breathing. Operational data is transmitted by a Supervisory Control and Data Acquisition (SCADA) system. SCADA is a series of land-line and satellite electronic controls and computers. The complex system allows Phillips 66 Pipeline LLC to remotely operate valves and pumps and monitor pressures and other vital information from a centralized location. Produce an integrity management plan designed to routinely assess identified threats and undertake any necessary measures to maintain the pipeline’s safety. Inspecting pipeline integrity using in-line devices (commonly called smart tools or PIGs) or hydrotesting. Phillips 66 Pipeline LLC provides a handy and user-friendly tool for determining the approximate location of Phillips 66 Pipeline LLC operated pipelines and terminals. These maps are live-updated, contain the most recent information on our active pipelines and assets, and can be easily searched by typing in any address in the United States. The National Pipeline Mapping System (NPMS) is a web program which will show you the approximate location of gas and hazardous liquid transmission lines near any searched address. It can be extremely useful to refer to the NPMS while you are in the planning phase of an excavation project to avoid unforeseen project complications. It’s important to know that NPMS does not include gathering or distribution pipelines. Though both pipeline markers and the NPMS are helpful tools, they have limitations. The only way to pinpoint a pipeline’s exact location is to call 811, the national “Call Before You Dig” number. Pipeline markers are signs (like the one pictured to the right) placed by operators at regular intervals along the general route of a pipeline. 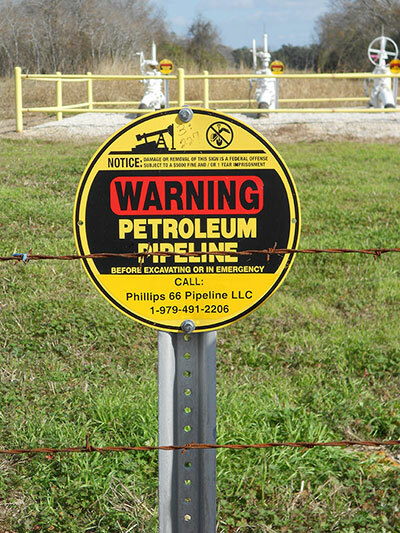 These signs are commonly found near road and railway crossings, at aboveground facilities along the pipeline system, and within a right-of-way. A right-of-way is the dedicated clearing of land that provides a safety buffer above and around a pipeline. Most often a right-of-way appears as a wide strip of manicured grass. Markers vary in shape, size and color, but all include the type of product transported, the operator’s name and emergency contact number. These signs simply act as a reminder that pipelines are nearby; they are not a replacement method for calling 811 before a digging project. 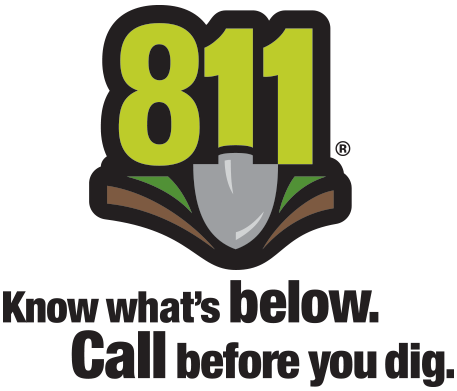 Every digging job – large or small and repeated or not – requires you to dial 811, the federally-mandated “Call Before You Dig” phone number. Dialing 8-1-1 to be automatically connected with a local One-Call center is not simply a good idea. In most states, it’s the law. By dialing 8-1-1, you are automatically connected to a local One-Call center. Notify your local One-Call center of your planned digging projects 2-3 days before work begins. Be sure to check the Common Ground Alliance’s state map to find out how far in advance you need to call. Operators with underground utilities in the vicinity of your project are notified by the One-Call center. Wait a minimum of two days for affected utility operators to respond to your request. Respect the marks. Remember that the location of underground utility lines is not an exact science and some areas may have varying degrees of accuracy. A Phillips 66 Pipeline LLC employee will be on site if you plan to dig very near one of our lines or facilities. Dig Carefully around the marks with care. Utilize hand-digging techniques appropriately and follow the recommendations of the CGA’s Best Practices guide. Call Again if rain or excavation work has caused the ground markings to be unclear. Call 8-1-1 anytime you begin a new job in the same area. The 1997 National Transportation Safety Board study, “Protecting Public Safety through Excavation Damage Prevention” concluded that premarking an excavation site is a practice that helps prevent excavation damage. White lining is the process of marking out the planned excavation site with white paint or flags prior to digging. The proposed dig site is identified by a continuous line or dash, flags, stakes or a combination of these. Dots make the site radius or arcs. Premarking an excavation site by white lining helps excavators to accurately communicate to underground utility operators where excavation is to occur. By taking the time to properly white line, you may avoid location confusion when planning work not directly tied to an address. The specific regulations for digging and contacting One-Call vary slightly from state-to-state; you can find more about your state here. Dependent upon your state’s One-Call law, your business or individual employees may be responsible for fines, repair costs, and additional property and life damages if a pipeline is striked, grazed, nicked. Some energy products, when unexpectedly released, that come in contact with an individual or ignite, can cause injuries or even death. By calling 811/One-Call, and adhering to markings, you are mitigating personal liability should an unplanned incident or accident occur. If you have bumped, grazed, struck, dented, or damaged or touched the pipeline in any way, it is imperative that you stop work and contact Phillips 66 Pipeline LLC through our emergency line: 1-877-267-2290. A small accident can be a big problem even a short time in the future. Retain the locate ticket reference number. 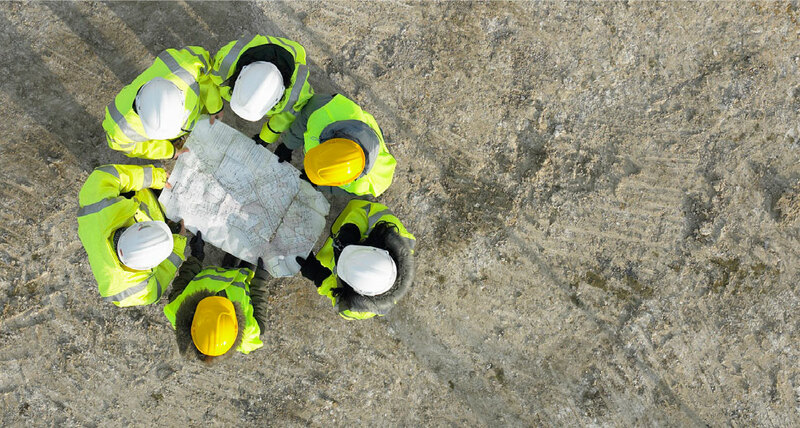 When on the job site, begin each day by hosting a pre-excavation meeting (sometimes called a Job Site Analysis or JSA). During this time, review the location of underground utilities with site personnel and discuss any potential hazards of digging near pipelines. Phillips 66 Pipeline LLC has created a series of eight free Tailgate Meeting Guides adapted from the Common Ground Alliance’s Best Practices guidance document. The free guides are available in English and Spanish and will help you document your safety efforts. Using the meeting guides may help mitigate service disruptions, harm to you or your employees, and possible fines and liability for tremendous repair costs. 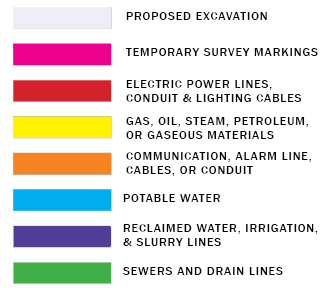 Make reasonable effort to protect and preserve the staking or markings of underground utilities. You are responsible to stop excavation and notify the One-Call center via 811 when a facility mark is removed or no longer visible. Phillips 66 Pipeline LLC will be on-site whenever work is being performed very near our facilities. A company representative will observe work conditions and has the authority to stop any work that is deemed hazardous to the pipeline or workers. In the same way, excavators are always encouraged to have an observer assist the equipment operator whenever performing a dig. Immediately notify 911, then the Phillips 66 Pipeline LLC emergency number (1-877-267-2290) anytime an unmarked underground facility is uncovered or whenever it is suspected a pipeline has been broken, caused to leak, nicked, dented, gouged, grooved, brushed, moved, etc. Dial 911 to report any pipeline pull, jar, snag, nick, dent, scrape or other pipeline emergency. Then notify Phillips 66 Pipeline LLC at 1-877-267-2290 when safe to do so. Many petroleum products have a distinct odor, such as sulfur (rotten eggs), or a strong petroleum-like odor. That said, workers cannot depend on odor alone to determine an energy product leak. In fact, most large diameter pipelines are not odorized, and the intensity of odor is no indication of the severity of a leak. Train co-workers and employees to recognizing the visual and audible clues to a leak whenever working in the area of a pipeline. Avoid contact with any fluids or vapors escaping from the pipeline. Even minor damage to a pipeline can result in future problems that could harm property, the environment, or pose a risk to human life. If you suspect that a pipeline has been hit, regardless of the extent of damage, immediately call the Phillips 66 Pipeline LLC emergency number at 1-877-267-2290. Even a miniscule nick in the pipeline’s protective coating must be assessed. We encourage planning officials to incorporate the best practices identified by the Pipelines and Informed Planning Alliance (PIPA) during the planning, review and approval process that accompanies new construction or land improvements. PIPA assists planners in becoming risk-informed about transmission pipelines and helps guide users to make better land-use planning and development decisions in relation to pipelines. PIPA has developed helpful toolboxes for government officials, property owner/developers and real estate managers. Visit PIPA to download free materials, including an informational brochure, a checklist for planning and design and an evaluation worksheet for developers. Public planning officials and utility excavators play an important role in pipeline safety by connecting pipeline operators to property owners, developers and public works specialists early in the project planning process. Public officials can help communicate concerns to owners and developers through the public planning review process – thus avoiding potentially costly project delays later. While property change of use is inevitable, proper planning and development oversight t by public officials can help ensure the safety and well-being of the general public, protection of the environment, an increase in pipeline awareness, enhanced communication between owners/developers and Phillips 66 Pipeline LLC, and the protection of Phillips 66 Pipeline LLC’s established easement rights. High-Consequence Areas (HCAs) are locations where a pipeline leak could have greater consequences to health, safety or the environment. Examples include dense population centers, drinking water zones, ecological areas, and navigable waterways. Preventative and mitigative measures are given priority in HCAs in order to protect these sensitive and vital areas. Contact our non-emergency line at 1-800-231-2566 to learn more about identified HCAs in your jurisdiction or to share information about a new HCA in your community. Planners and developers must understand the operational need for Phillips 66 Pipeline LLC to gain access to its pipeline rights-of-way. Phillips 66 Pipeline LLC has procedures in place for conducting excavations and repairs on pipelines, in compliance with the U.S. Department of Transportation, Pipeline and Hazardous Materials Safety Administration (PHMSA) regulations. These procedures include risk assessment and safety requirements. A written plan is prepared for each project, and, where applicable, all affected parties, including operations employees, pipeline controllers, contractors, other utilities, neighbors and local emergency responders are made aware of the plan. Phillips 66 Pipeline LLC regularly conducts pipeline right-of-way patrols on foot or by air. Employees perform additional inspections as needed. Most importantly, during an unplanned release, it is imperative that emergency responders and pipeline company representatives are able to quickly access the line with ease. Each year, Phillips 66 Pipeline LLC receives approximately 150,000 requests for line location. Since 2014, Phillips 66 Pipeline LLC has recognized those companies that have the most frequent One-Call tickets submitted nearest our areas of operation and suffer no known One-Call process errors that result in Phillips 66 Pipeline LLC involvement. Recognized companies may receive a certificate or award for display, promotional materials to publicize their recognition as a One-Call Elite Partner, and a reference on this website. You can increase your chances of becoming an Elite Partner by always dialing 811 before starting any job planning or work.